European Central Bank President Mario Draghi is going to offer lenders new long-term loans. But his plan to keep policy rates at record lows for longer makes their lives harder. And if growth turns out to be as weak as the ECB now expects, more of the loans they make may go bad. The two countries plan to cooperate more on defence and culture. If only harmony extended to issues such as economic governance. And even when the pair speak as one, say on Alstom-Siemens’ rail merger, they don’t always get their way. But that is a sign of success, not failure. The currency enters its third decade with flaws that date back to conception. They were fully exposed after early market successes gave way to a teenage existential crisis. These weaknesses have the power to ruin adulthood as the drug of cheap central bank money slowly runs out. After nearly a decade of bailout-related austerity, the prime minister is promising giveaways ahead of a 2019 vote. There’s a case for spending more. But Italian jitters and the end of the European Central Bank’s bond-buying make this a bad moment to test investors’ patience. Finance ministers extended until 2024 a generous capital treatment for banks’ stakes in insurers. It allows Mediobanca, which has 13 pct of Generali, to add 100 bps to its capital ratio and delay a sale. CEO Alberto Nagel has a larger buffer to resist market jitters, or do deals. The single currency’s finance ministers agreed to make sovereign bailouts and debt restructuring smoother, and share the cost of winding down banks. Yet support for troubled countries and lenders remains limited. The region is still unprepared to cope with future economic shocks. France and Germany want to set up a pot of money to fund investment in the euro zone. The fund will only be available to those who comply with EU fiscal rules. The idea is a nice one but there may be too little money and too much complexity for the incentive to be effective. This first in a series of "Ten Years After" essays argues the bold monetary experiment that followed Lehman’s demise unleashed speculative manias, carry trades, populism born of inequality, capital misallocation and a China bubble that pose grave threats to the financial system. The single currency is a “EuroTragedy”, Ashoka Mody writes. The Princeton professor sees fatal historical, political and economic flaws. But this drama is not over yet. The euro may still be part of Europe’s historic destiny, if destructive nationalism can be restrained. Eight years after seeking financial help Athens can at last support itself, helped by extra euro zone funds and debt relief. But borrowings of over 300 bln euros mean it must maintain a tight budget, and submit to regular scrutiny. Doubts over its debt sustainability will linger. Banco BPM sold 5 billion euros of dud loans for 34 percent of face value, amongst the highest prices to date. Rosy valuations and the ECB’s more lenient stance on disposals are a boon for lenders. But buyers risk downplaying the threat posed by Italy’s radical government. 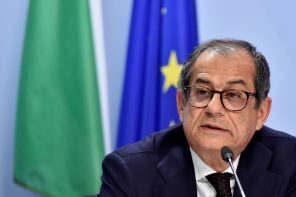 Newly appointed Economy Minister Giovanni Tria soothed investors by promising to stick with the euro and cut debt. His comments are a marked departure from the radical government’s budget-busting promises. The economics professor’s orthodox stance may prove politically untenable. As Rome fumbles its single-currency bona fides, global investors are taking steps to protect themselves. In a possible legal first, lawyers added language to a share purchase deal to guard against Italy leaving the euro zone, “voluntarily or by means of expulsion”. The German chancellor wants an investment budget that would help poorer countries and a souped-up bailout fund. The ideas are a pale imitation of French leader Emmanuel Macron’s proposals. With monetary policy exhausted, the euro zone looks ill-prepared for the next crisis.